412 pages | 17 B/W Illus. The second edition of this highly regarded book provides a concise and accessible introduction to the principles and elements of policy design in contemporary governance. It examines in detail the range of substantive and procedural policy instruments that together comprise the toolbox from which governments choose tools to resolve policy problems and the principles and practices that lead to their use. Addresses the issues surrounding not only individual tools but also concerning the evolution and development of instrument mixes, their relationship to policy styles and the challenges involved in their (re)design. Providing a comprehensive overview of this essential component of modern governance and featuring helpful definitions of key concepts and further reading, this book is essential reading for all students of public policy, administration and management. 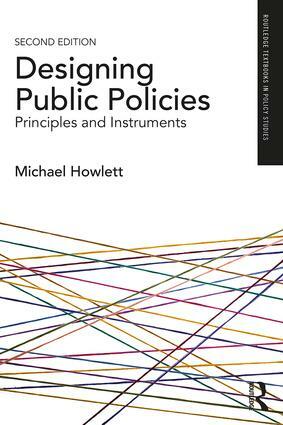 "Michael Howlett’s book is an important integration of various strands of the public policy literature. By focusing on the design of public policies he provides an innovative discussion of the policy process and also means of analyzing policies." - B. Guy Peters, University of Pittsburgh, USA. "Some policy books are indeed coherent though they funnel the reader into a narrower scope; some inspire a widening of views, but lack perspective. This excellent volume Designing Public Policies however combines both a wide and a coherent treatment of relevant literature." - Hans Th. A Bressers, University of Twente, Netherlands. "A unique and valuable synthesis of key literatures on policy design and implementation. Essential reading for the researcher and student." - Peter John, King’s College London, UK. "This is a welcome update to an invaluable source for scholars and students of public policy and governance. The book rightly highlights the importance of policy design and tools in the analysis and understanding of policy." - Bruce Stafford, University of Nottingham, UK. Michael Howlett is Burnaby Mountain Professor and Canada Research Chair (Tier 1) in the Department of Political Science at Simon Fraser University specializing in public policy analysis, political economy and resource and environmental policy.